Ajitora Invites Internet Community to Join in the Tx2 Goals by Sharing an UPROAR! 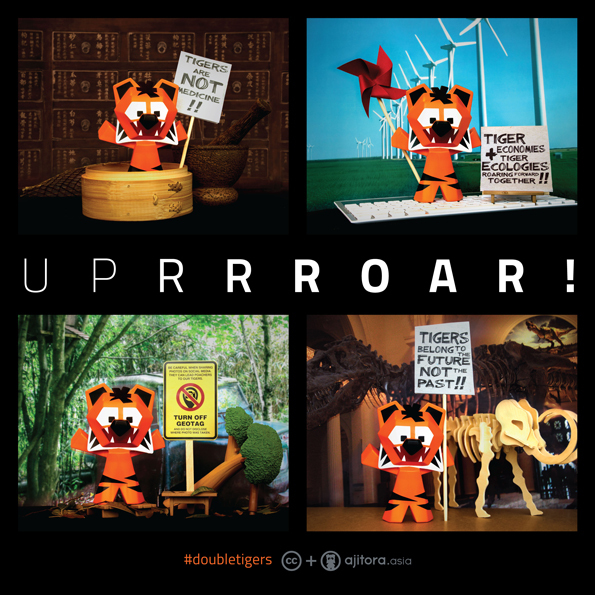 2016.02.02, Hong Kong – Building on Ajitora’s appointment as an Ambassador for Tx2 (the goal to #doubletigers in the wild by 2022 jointly supported by GTF, WWF, TRAFFIC and others), DotAsia announces today the release of Ajitora images and designs in a CreativeCommons Plus (CC+) license. This is an invitation to the Internet community at large to join the Ajitora movement by freely remixing him into personal or commercial works alike. The Ajitora images are released as a CC+ license with Attribution-NonCommercial-NoDerivs (CC BY-NC-ND) as a base. With the acceptance of the Ajitora obligations: that the resulting works must not be counter to the Ajitora Movement’s mission to support tigers, the eco-system, and a collaborative Asia in a positive manner, users may further remix, build and distribute derivative works with the Ajitora images, even commercially, similar to an Attribution-ShareAlike (CC BY-SA) license with credits to “@ajitora.asia”. For more information, please refer to http://cc.ajitora.asia. The Ajitora images can be downloaded at http://img.ajitora.asia. Derivative works are encouraged. The Ajitora team at DotAsia is eager to work with you on crossover products, materials and have Ajitora appear in your commercial or charitable initiatives alike. Through crossing over with consumer products and service, the spirit of the Ajitora movement can reach beyond the environmentally conscious crowd. If you would like to explore working with us on collaborative efforts, please do not hesitate to email us: ajitora@dot.asia. Tigers are a symbol for Asia. Wild tiger population dropped 97% from 100,000 just a century ago, to as few as 3,200 today. Tx2 is a vision by tiger range countries (China, India, Malaysia, Indonesia, Thailand, Cambodia, Vietnam, Nepal, Laos, Bhutan, Bangladesh, Myanmar and Russia) to #doubletigers in the wild by 2022. Tx2 is supported by WWF, Global Tiger Forum (GTF), TRAFFIC, etc. Unbeknownst to many is how the Internet impacts wildlife environment. Proliferation of illegal wildlife trade online coupled with abusive mining of social media data for criminal poaching and deforestation, threaten the survival of tigers and other wildlife. Ajitora is the center point of a multi-dimensional campaign from technology, Internet policy, to consumer market engagement to support tigers and a sustainable wildlife environment in Asia. DotAsia (https://www.dot.asia) is a registered not-for-profit charitable organization (DotAsia Foundation: IRD 91/12820) with a mandate to promote Internet development and adoption in Asia. DotAsia operates the “.Asia” top-level domain (TLD) as part of the core global Internet infrastructure, and is formed as an open consortium of official domain authorities in Asia, including .CN (China), .JP (Japan), .KR (Korea), .IN (India), .NZ (New Zealand), .PH (Philippines), etc., and regional Internet organizations including APNIC, APNG, APIA, APCERT, APRALO, APTLD, etc. Since the launch of “.Asia”, DotAsia proactively contributes to the Asia community, supporting many charitable projects, e.g. : One-Laptop-Per-Child Asia Pacific (http://www.olpc.asia), Information Society Innovations Fund (http://www.isif.asia), Asia Pacific Regional Internet Governance Forum (http://www.aprigf.asia), Food Revolution Day initiative with Jamie Oliver (http://www.frd.asia), NetMission.Asia (youth volunteer program &network — http://www.netmission.asia), Go.Asia (http://www.go.asia), and many more.